Two black Art Deco dressers Four drawers Square brass handles Makers Mark on back. 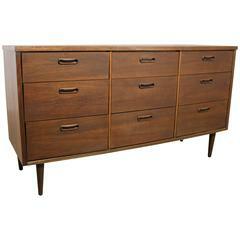 Beautiful midcentury dresser with metal pulls and sliding doors. 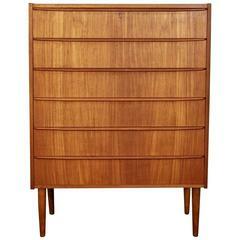 This piece also has metal legs and seven drawers. 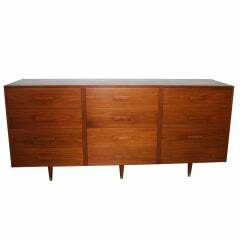 Beautiful Danish modern Mid-Century six-drawer dresser in teak wood. Beautiful wood grain, on four tapered legs. 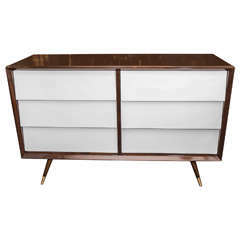 This Mid-Century Modern dresser features a dark painted finish, round brass pulls, cone-shaped legs and brass sabots, circa 1960. 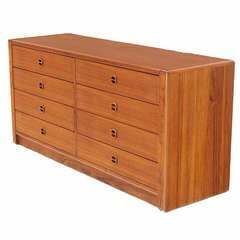 Nice vintage modern danish teak dresser featuring four drawers, sculpted pulls and a sliding door with spacious storage. Please confirm item location (NY or NJ). Elegant 12 drawer dresser in walnut with walnut handles. The case floats on three pairs of tapered legs with brass sabot. 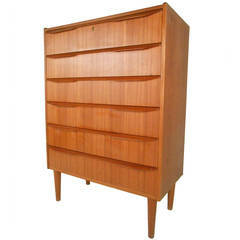 Very nice teak wood grain Danish modern dresser.